Lately, NPQ has been covering a flurry of stories about the question of nonprofit property tax exemptions. Recent stories involve nonprofit hospitals in New Jersey and Connecticut, as well as the universities of Princeton and Yale. In these cases, among others, lawmakers, the courts, local officials, and the nonprofits themselves are all trying to find some compromise that will meet the needs both of local tax bases and the institutions themselves. But the challenge of nonprofit property tax exemptions is probably no more acute than in tiny Potsdam in upstate New York, near the Canadian border and some 300 miles northwest of New York City. It’s the kind of situation that leads to the creation of PILOTs, or payments in lieu of taxes, common in many cities in the northeast. “With 69 percent of village properties exempt from property taxes, you could call taxpaying property owners financially burdened,” says the Watertown Daily Times. That would be an understatement. New York’s state comptroller has called Potsdam the most fiscally stressed village in the state. Taxpayers are not happy about subsidizing the tax-exempt status of local nonprofit institutions, and some businesses say the high property tax assessments are driving them out of town. “I don’t think it’s fair that the village taxpayers have to pay for everything. There are all these universities and hospitals, and there should be some way they should be able to pony up a little bit,” said one local storeowner. 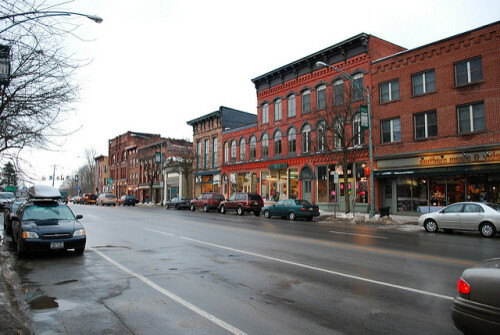 And when Clarkson University, a prestigious private four-year research university, purchased seven properties in town primarily for student and faculty housing, it only added to the percentage of tax-exempt property in the village, although one of the properties will be taxable because it is being leased to a local startup company. Some locals believe that village taxes are “running away with themselves,” and are upset that they must pay, while large local universities and hospitals don’t. “Forty to 50 percent [of village residents] pay 100 percent of the taxes.” said one. Some say the situation has become a deterrent to buying in the village. Clarkson argues that residence halls and other on-campus dwellings are part of the college experience. Unless specifically exempted, Clarkson students are required to live on campus for all four of their undergraduate years. The Daily Times writes that Clarkson’s CFO said “it’s obvious that [the] college…is an institution which contributes ‘a great deal’ to the local economy, and adds to the tax base through properties not directly related to the college’s mission,” referring specifically a for-profit subsidiary of the college which owns an inn and bookstore. The college is also renovating a building that will go on the tax rolls when it is rented out to for-profit tenants. In 2015, the for-profit enterprises contributed over $200,000 in property taxes to the village, local schools and the county. In addition, Clarkson says it has added “millions” to the local economy through campus jobs aimed at serving students, the commercializing of research, college operations, and construction, and by generating state and local tax revenues. The college points out that the faculty and staff who live in the village personally contribute to the local tax base, and that it has also supported the village through donations and in-kind engineering expertise for public works projects. “We’re an economic engine. We’re proud of the fact that we play such a big role in energizing the community,” said Clarkson’s CFO.